Uh-oh. The Giant Monster Council in Japan has been disbanded! Not the Giant Monster Council! So much downtime between rubber suit attacks, all those politicians just sat around watching Godzilla movies. GAMERA THE BRAVE is the 12th Gamera movie, and to date, the 1st and only Millennium era Gamera film. Dissolve to 2006. 33 years later, the same boy – now a man – looks out across the same bay. This opening scene, with its cinematic music, tragic events and good production values, already places this movie above many of its predecessors. Now it aims for mystic resonance: Gamera sacrificed himself. For humanity. That’s soooo Jesus Christ, 33AD. 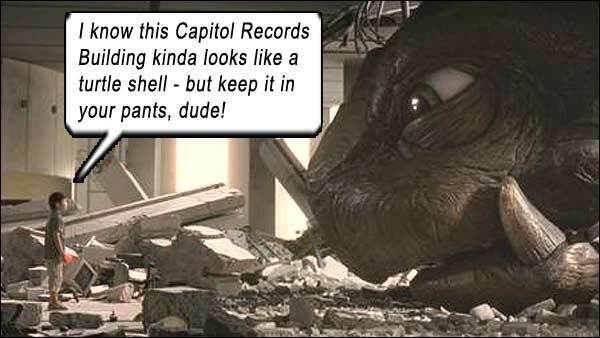 If you think I’m being facetious, think again… A baby Gamera hatches in 2006 – 33 years after the death of his parent. Firstly, does that make Gamera a hermaphrodite? And secondly, an egg taking 33 years to incubate makes no sense – until we connect the age of Jesus on the cross. The Giant Monster Council is disbanded about the same moment Toru discovers the egg near Gamera’s death-site. It hatches in his hand, and out pops a tiny baby turtle! I still cannot figure whether this turtle is a practical special effect or real, as it relates to its environment very authentically, and is very animated and expressive (those are definitely practical effects!). Full marks to the filmmakers (writer Yukari Tatsui and director Ryuta Tazaki) for capturing such character in a baby turtle! Toru names this amusing little friend Toto and takes him home surreptitiously. His father Kousuke is the owner and chef of a restaurant, so Toru doesn’t want to find turtle soup on the menu. Of course, Toto is the Son of Gamera, as we find out soon enough when he inadvertently hovers, and discovers he can breathe fire at will. GAMERA THE BRAVE is about coming of age – for Gamera/Toto and Toru. 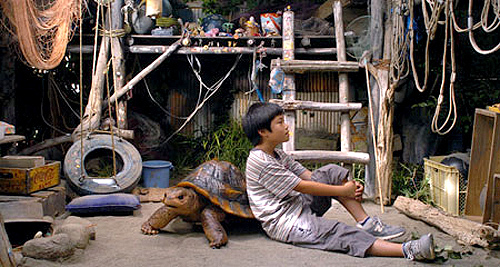 When his father does find out about the “baby Gamera” (a term used in this film more like a species name than a proper noun), he admonishes Toru to release Toto into the wild, but Toru refuses to admit the connection, as he tearfully explains, “Toto is not a monster, because monsters fight and die, right? Toto is not going to die!” Our hearts break. Toru’s tirade is purely based on the loss of his mother. Also, after the disbanding of the ever-relevant Giant Monster Council, a giant monster named Zedus appears and tears up the city! Just because. (We never question the motivation of these monsters now – it’s not about territory, food or mating – we just figure they hate Japan innately.) But no one can DO anything to fend off the monster because, hey, no Giant Monster Council. It’s not like any other department in the city will take up the slack to provide emergency housing, repairs, electricity, counter-measures, no. The Giant Monster Council did all that, and lord knows, we can’t call them back from whatever other dimension they disappeared into when they disbanded. Also, it’s not like the Giant Monster Council even did anything while they were sitting on the bench, because the same toy buildings got knocked over anyway. So you’re saying we’re fucked either way. Zedus is a cross between a tyrannosaur and Roland Emmerich’s 1998 GODZILLA. Some speculate the likeness is intentional, just to have yet another dig at that special effect that nobody likes. The foundation of this movie’s monster effects is still rubber suits, but everything else around that reality is done with such a verve of creativity (the directing, editing, process shots, set design) that we are reminded of the original GODZILLA team working at their peak with the limited resources they had, to bring you a grandiose movie experience. Toto grows to the size of a Volkswagon Beetle in short order, and the next thing Toru knows, his pet is gigantic, and in a life-and-death struggle with Zedus for the rubber soul of the city. The acting is poignant and stirring, with a dynamite performance from Tomioka as Toru, who commands such empathy when trying to explain why his turtle should not be fighting Zedus, “Toto is just a child! He was born in front of my eyes just a short while ago!” His father tells him, “That huge Toto you saw out there is Gamera now!” Still Toru refuses to believe. That amulet mentality from the 1990’s GAMERA Heisei trilogy – where charms and necklaces create psychic links between monsters and men – is at work here, as Toru realizes that Toto’s power flows from a red birthstone that must be delivered to him, in order to defeat Zedus. The last sequence may be construed as cheesy – but it works on many levels! As children – somehow mystically tasked to deliver the birthstone – hand off this talisman to each other as they run, run, run against the fleeing crowd to save Toto in the midst of battle. In slow motion, each child runs, accompanied by choral soundtrack, no audio of the monster fight progressing close by, music rising in intensity as the stakes are ramped with each child hitting an obstacle and having to hand it off to another, who becomes a part of the quest. It’s Kurosawa’s samurai standing against the flow of invaders, it’s Spielberg’s little scarlet child amongst the black-and-white adults, it’s Christ’s importuning that only the innocence of children shall overcome the obstacles to paradise. Shouldn’t the Giant Monster Council be doing something this dangerous? Damn you, Giant Monster Council! Though GAMERA THE BRAVE is unabashedly made for kiddie appeal, it is one of few movies that does not condescend to stupidity to make that connection. The fully-grown Toto still does not assume the visage of the ferocious Gamera from the Heisei era; he retains big puppy-dog eyes and a smoother aspect. All the better to sell to kiddies. What he does retain is his bad-assery. Toto comes to the realization that HE must now assume the mantle of protector; that his time is ahead, and that he cannot simply sacrifice himself at will. The Giant Monster Council would concur, if they weren’t all hiding under their beds. Starring: Ryô Tomioka, Kaho, Shingo Ishikawa, Shogo Narita, Kanji Tsuda, Susumu Terajima, Tomorowo Taguchi, Kenjirô Ishimaru, Megumi Kobayashi.